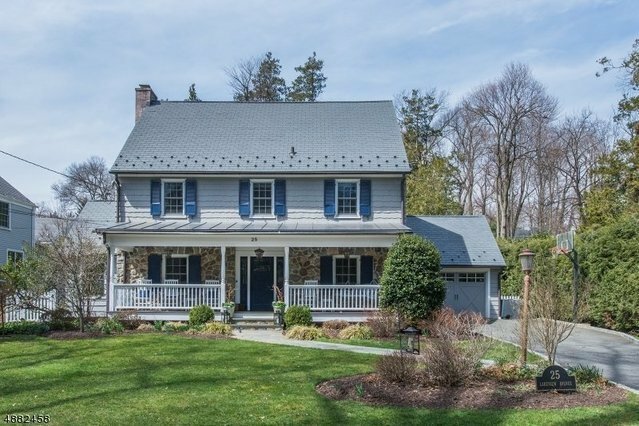 Colonial, Single Family - Millburn Twp., NJ Beautiful 6BD/4.2BA Colonial settled on prestigious Lakeview Avenue. Country charm abounds starting with the sweet front porch. A welcoming foyer is flanked on either side by the formal DR with bay window and formal LR with fireplace. The heart of this beautiful home is the family room/kitchen. Many birthdays, holidays & super bowl parties have been hosted in this warm and inviting space. French doors allow guests to spill out onto the slate patio, complete with two sitting areas and fully fenced backyard. Upstairs is home to the master suite plus 3 add'l BRs, hall BA & sunny laundry RM. 3rd floor retreat w/ 2 BR & full BA. Finished LL with RR, craft area & climate controlled wine cellar. This is classic Short Hills living at its finest.